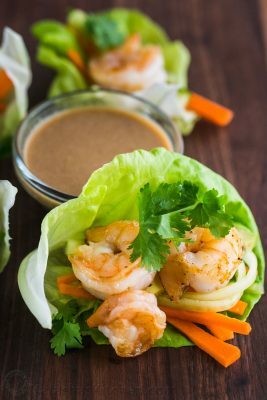 Shrimp lettuce wraps loaded with fresh veggies and juicy shrimp. The peanut sauce is exceptional and surprisingly simple. Lettuce wraps are a low carb, healthy dinner. Rinse and pat dry your shrimp. Sprinkle shrimp with salt and pepper to taste. Add 1/2 Tbsp olive oil to a large hot non-stick skillet. Once oil is hot, add shrimp and sauté on med/high heat 2 min per side or just until cooked through then transfer to a plate. Cut your cucumber and carrot into thin matchsticks. Slice your avocado into strips, cut cilantro springs in half. Make your peanut dressing, combine 1/2 cup sesame ginger dressing with the 1 1/2 Tbsp peanut butter in a mason jar or tupperware with tight fitting lid. Shake thoroughly until smooth. To assemble lettuce wraps, place the lettuce cups on a platter, add several strips of carrot and cucumber, sliced avocado, 2 shrimp and a couple of large sprigs of cilantro. Drizzle the top with the peanut dipping sauce.